Adventure has an un-canny way of finding me. My heart is wild and it yearns to soar on the tops of the mightiest of mountains, in places where I become one with nature in the harshest of elements. British Columbia holds all the promise of what my heart yearns for: adventure, the intoxicating sound of nothing but the wind whispering to me through the trees, a place where I can hunt the hunters—mountain lions—with the aid of my best friend and companion, my Rhodesian Ridgeback, Kruger, at Otter Lake Outfitters. The truck door shut hard with the ice having crusted over the hinges. Ten O’clock at night heading into the frozen mountains of Central Oregon. The skiff of snow was minimal but we were hoping that it would be just enough to locate the fresh tracks of a bobcat. It was going to be an all-nighter but it was my only opportunity to take advantage of the snow before heading to Las Vegas for RMEF’s Hunter Christmas and the National Finals Rodeo for ten days. I needed to be on the mountain one more time before disappearing into the concrete jungle of the city. The hounds were eager as usual, Kruger jumping in the box, ready for the ride. Mile after long mile it seemed that all we encountered were coyote tracks which can be very easy to confuse with a bobcat. Drive, stop, look at tracks, drive on…our search went on for hours until my eyes could no longer stay open. This was my first time sleeping in the front seat of a pickup truck, too stubborn to call it quits and go home. My tiny dog Zoie was hogging the seat but somehow, I managed a couple of hours of sleep, just enough to refresh my vigor for the pursuit of finding a track. Everything looks different in the dark and that is double true at night. The warm welcoming mountains become cold and dark. Roads that you gladly travel during warmer months become treterous with the snow threatening to hold you tight to the ground. Tires spinning, I squeeze the oh S#*T handle more than I care to admit. The morning light was bitter sweet, my time was running short, but just when I thought we wouldn’t find a track, there it was and it was a big track that was smoking red hot. The hounds know when they are about to go to work, stirring anxiously in the box, whining with anticipation. Rooster, Dane and Fletcher were called forward by name, collared and turned out along with my pup Kruger. 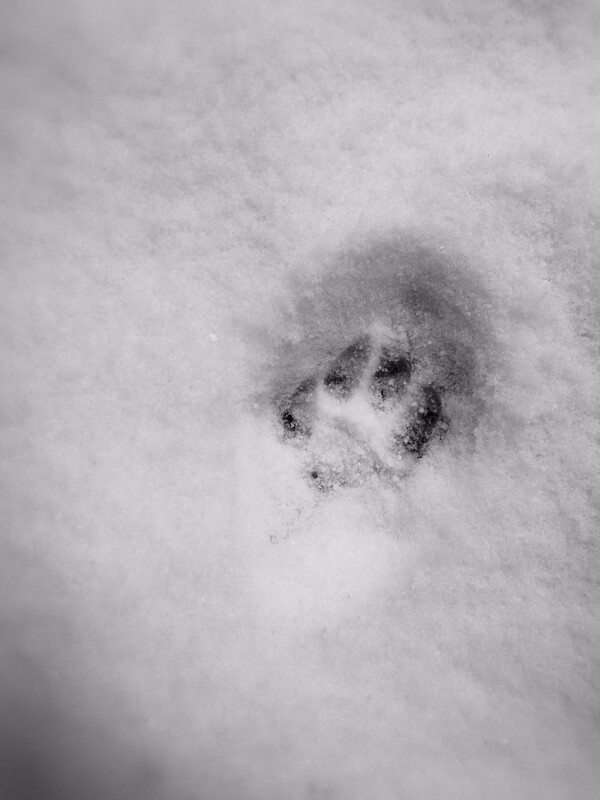 Tracking bobcat is nothing like I have seen before. In order for the hounds to smell the track, they literally have to place their nose into the track getting little dimples of snow on the tip of their nose. Many hounds will easily track a bear or lion but due to the difficulty and minimal scent, the bobcat is an extremely difficult animal for the dogs to track. The pace for the bobcat race is much slower than that of a bear or lion race but the dogs still travel much more swiftly than I can walk, especially in the adverse, steep mountain conditions. He was unsure of the process and soon, the hounds were far ahead of us. Some hounds, honor other dogs meaning, if they bark, they will follow the bark to reach the quarry faster. This can be a good or bad thing, good if the hounds are on the right track, bad if they are not. Kruger does not honor other dogs, he honors me, which can be a good or a bad thing, it all depends on the situation. The GPS monitor beeped that the hounds were treed so we quickly followed the sound of the baying. The bobcat was so high in the giant tree that he was not easily seen. Kruger excitedly trotted around the tree base, Dane and Rooster had actually climbed into the massive tree trying for an opportunity at the cat. The frenzy of excitement had both me and the dogs filled with anticipation and excitement. Kruger does not bark when treed, but the thundering sound of the other hounds echoed off the nearby cliff walls; it was a sound that I had waited my entire life to hear. This was the moment that I had planned for and dreamed about since long before Kruger’s birth or arrival into the USA from Africa. My African Lion Hound, was here, on American soil doing the exact job that he had been bred to do. Hunt cats. All be it, he has everything to learn about hunting bobcat, this was our first glimpse at what hunts might be in store for our future. Making several loops around the tree base, there was only but a small window of opportunity for a shot. The sound of success rang out and Kruger was looking up towards the cat, anxiously awaiting his decent from the tree. The all night pursuit had paid off, I was going to make the trip to Las Vegas tired but it was all worth it.